Lazer (our pixel perfect pixie) was always fascinated by the intricate detail of the eye and its iris. As a result he had spent a severe amount of time perfecting a drawing of a very large eye ball. "Very nice," I said, "but what do we do with it?" 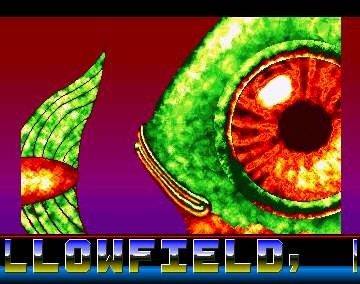 Lazer then went back to Deluxe Paint and incorporated his eye ball into an even bigger fish. This fish took up 4 whole screens! 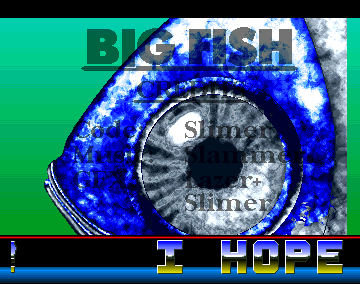 It was the biggest drawing, let alone fish, I'd ever seen on the Amiga! Lazer didn't know. So the fish stayed at the back of my art collection whilst I worked on other projects. 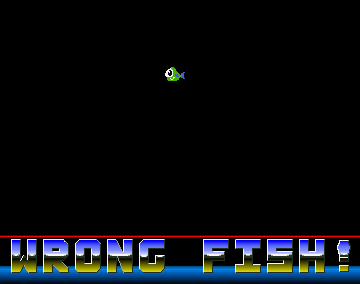 Then one weekend I rediscovered this fish and felt a little guilty that it had been neglected for so long. So in order to absolve my guilt, I cobbled together this fishy little number. One day, shortly after I had started Amiga coding, I was feeling a little disheartened about having lots of routines but no finished demo / intro to show for them. So I tried to write a simple little intro, which I called "Bob's Your Uncle". 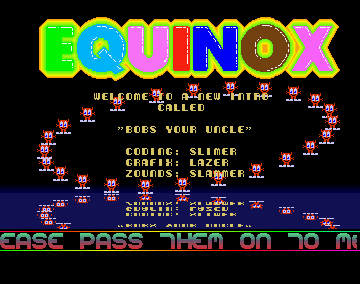 But	alas, the code was slow and the code was bugged and I never got round to releasing it. 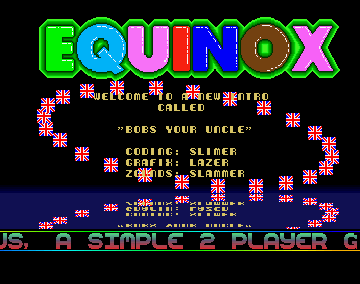 Much later on, I came across this naff little intro and figured that actually, it could look quite good - if coded properly. With nothing else to do on that bright summers day, that's what I did! 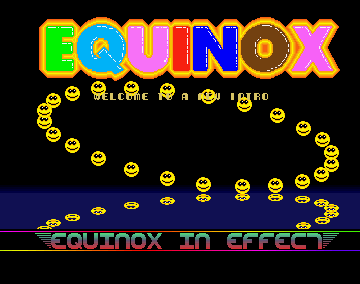 And here's the result, a cute little Equinox intro!